TripleCheckMate is a tool for crowdsourcing the assessment of Linked Open Data. 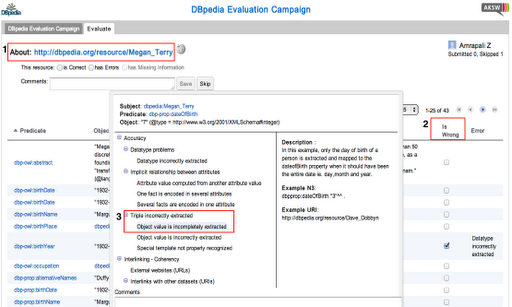 It was developed under the DBpediaDQ project as an application for evaluating the correctness of DBpedia. TripleCheckMate provides an easy-to-use user interface with multiple resource assignment methods and a ready to use error classification scheme. It is released under Apache 2.0 Licence. Don’t miss the 12th edition of the DBpedia Community Meeting in Vienna, the city with the highest quality of life in the world. Read more about "DBpedia Day @ SEMANTiCS 2018"
DBpedia, a community project affiliated with the Institute for Applied Informatics (InfAI) e.V., extract structured information from Wikipedia & Wikidata. Now DBpedia started the DBpedia Open Text Extraction Challenge – TextExt. Read more about "DBpedia Open Text Extraction Challenge – TextExt"
This year’s SEMANTiCS conference which is taking place between September 12 – 15, 2016 in Leipzig recently invited for the submission of research papers on semantic technologies. Read more about "Accepted Papers of AKSW Members @ Semantics 2016"